A new highrise apartment tower is planned for the busy intersection of 38th and Chestnut Streets. This is the latest story on my blog about highrise apartment towers in the city. 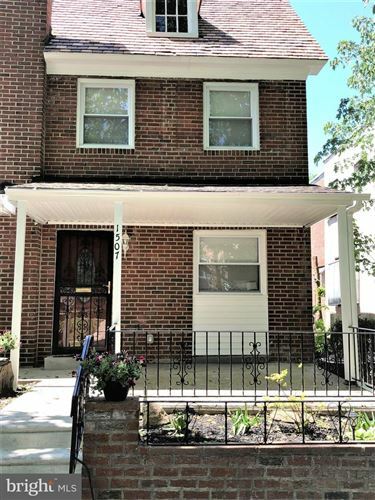 This apartment tower will replace two historic townhouses (at 3723 and 3725 Chestnut Street), a small apartment building that used to be a townhouse, and a small yard next to the Philadelphia Episcopal Cathedral, on 38th Street, in University City. 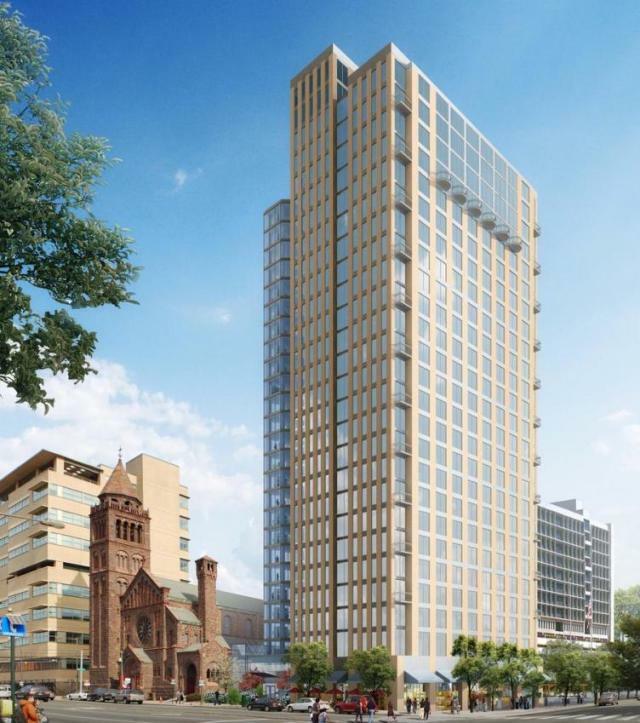 The developer is Radnor Property Group, which is purchasing the neighboring properties from the Episcopal Cathedral to build the apartment tower and in order to provide revenue to renovate the existing church building and fund the church’s community programs. It is being designed by BLT Architects, also known as Bower, Lewis, Thrower Architects. The new tower will be 25 storeys tall and have 280 rental apartment units, and it will have retail at the street level, along both Chestnut and 38th Streets. It will have a linear, modernist look with abundant windows and balconies. There will be a church community center and school, attached to the original church structure, and a day care center in the basement. 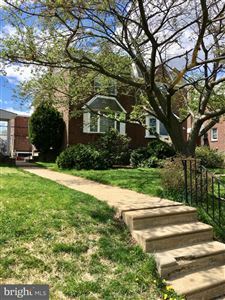 The church applied to have the historically designated townhouses, that were used as the church’s parish house, demolished last year, arguing that they did not have sufficient funds to afford the approximately $3 million renovation of their historically designated cathedral and needed to sell the townhouses and yard to obtain those funds. The City’s Historical Commission granted the demolition permits, saying that the demolition was in the “public interest” according to preservation laws, but the Preservation Alliance of Greater Philadelphia objected to the demolition, arguing that the townhouses, designed by architect Charles M. Burns, were still too historically significant and that tearing down historically designated buildings to save other historically designated buildings would set a dangerous precedent. When the Preservation Alliance lost their appeal to the Historical Commission, they decided to work out an agreement in which the Episcopal Cathedral committed in writing to spending the funds from the sale of the next door properties to renovation of the existing cathedral and agreed to a timeline for the renovation and maintenance for 50 years, if the Preservation Alliance dropped their lawsuit in Common Pleas Court. The developers are planning to break ground in September and be ready for occupancy by 2015. This latest apartment tower is located in an important area and it will be designed to appeal to a broad group of tenants, not just the usual student tenants. 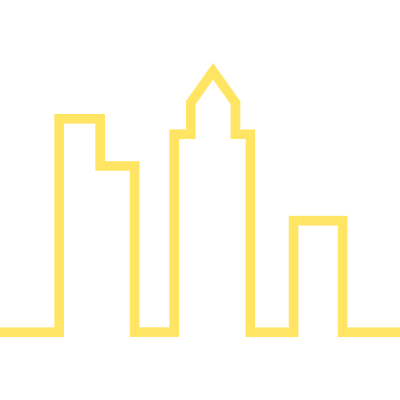 Its location next to the rapidly expanding University City Science Center, and close to the University of Pennsylvania and Drexel University campuses, will make it attractive for workers in those locations, as well as, come Center City workers. It will, also, further animate a key intersection in University City and add to the skyline of this part of the city (although, I don’t think it would be a bad idea if the developers preserved and renovated the facades of the brownstones as part of the project). It is one of several major developments in the center of University City, including the Science Center developments at 38th & Market Streets and 34th & Market Streets, and another new highrise apartment tower, soon-to-be built by the Science Center, at 36th & Market, that will make the heart of University City feel like an extension of the city’s downtown. Also, developer Campus Apartments is planning to build a new apartment building, at 41st and Walnut Streets; next to the new Homewood Suites by Hilton, and a highrise apartment tower and highrise office tower at a large site at 42nd & Chestnut, which is currently occupied by a large brick warehouse. And, the link between University City and Center City is being strengthened by the development of the Cira Centre residential and office highrises that I recently wrote about.